“I’m struggling to finish this PhD dissertation, so instead I’ll transmute it into a novel about a graduate student struggling badly to finish her PhD dissertation,” thought debut novelist Juliet Lapidos. (Possibly.) While this may at first glance sound like a nauseating meta hall of mirrors, Talent is actually entertaining and insightful from start to finish. After all, the mechanics of artistic inspiration are an engaging enough concept, but few aside from thesis advisors actually read English literature dissertations. Distilling the key concepts into a tightly organized narrative was a shrewd decision. Anna Brisker approaches the tail end of her twenties, the beginning of which were filled with success and promise, but finds herself stuck in a rut with the aforementioned dissertation. In it, Anna seeks to contend that artistic inspiration is something that can be catalyzed through the convictions of hard work and will power. This runs contrary to the belief that inspiration only “comes when it comes,” the mystical directive of unquantifiable forces that can’t be tamed or commanded. She decides to investigate the case study of author-within-the-book Frederick Langley, who wrote and published multiple renowned short story collections within a short span of time, then published nothing for the remaining years of his life. Langley’s two surviving post-publication notebooks presumably contain story ideas and/or his yet-unknown rationale for withdrawing from authorial endeavors entirely. They’re currently kept private by Langley’s niece Helen, who’s engaged in a battle with Anna’s university to keep the notebooks permanently out of public view. Surprisingly, these notebooks prove a more effective Macguffin than one might expect, and in between chapters, readers are afforded isolated glimpses of its contents. Instead of a fluffy attempt to pad the length of this 240-page novel, the excerpts beautifully complement the narrative’s themes of authorial intent, motivation, and the tension between recognition for accomplishment versus the inherent joy of the creative process itself. It’s for this reason that Talent emerges as a far more substantive work than The Fault in Our Stars, both of which feature avid readers on a quest to decipher a cryptic artist’s true intentions. 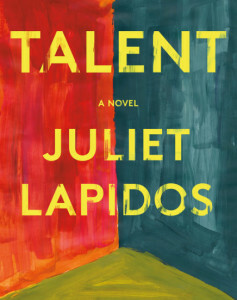 Perhaps Lapidos succeeds because she comes out of the gate with no illusions, acknowledging multiple issues within the field of literary criticism, a domain populated by self-serving vultures who use other people’s creativity for their own ends—vicious hunters who salivate when the quarry (the author’s text) appears, ripe to seize for an indulgent feast. The byproducts of the field’s business model are readers who don’t read books for the innate enjoyment of reading a story, but instead, to extract arguments from text. Since fictional works are the currency upon which graduate students hinge their very livelihood, the idea that they might get lost in a book on a Sunday afternoon is laughable—a distant memory. The tension between building toward a payoff versus the intrinsic joy of the process was always on Langley’s mind. It isn’t hard to imagine that Lapidos herself wrestled with these ideas while navigating her twenties. After all, she does have a BA in comparative literature and and a master’s in English literature. There’s an ever-so-plausible possibility that the latter was obtained by a doctorate program cut short. Lapidos’ debut is excellent but not perfect, as many of its tiresome meta-jokes feel obligatory. Past a certain point, readers just want an author to use a metaphor without calling attention to the art of using a metaphor. Having Anna and Helen sit down for spaghetti with mismatched plates, on the same page as a meditation on how authors build a scene around food, is unforgivable (though not to the same excruciating extent as last year’s Asymmetry). 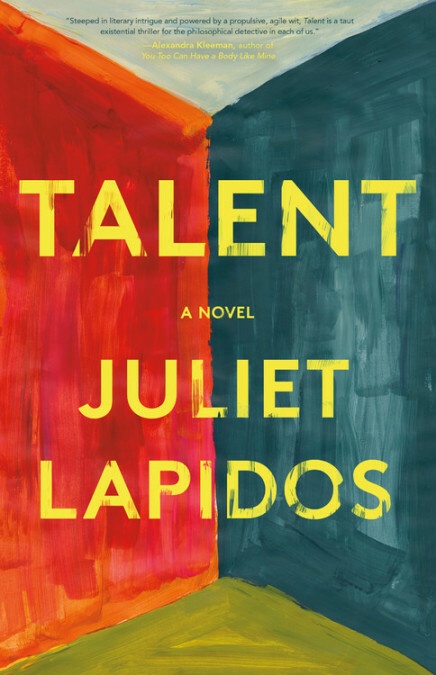 Talent is a highly accessible work of fiction, yet Lapidos insists on using words that aren’t warranted in any context: liminal, depilate, prelapsarian, palimpsest, and of course, abstemious. (WordPress identifies three of those words as spelling errors. Enough said.) She also shoehorns in some unnecessary jabs at the original sin of evil white men, for no other reason than it’s 2019 and the cheap applause to be garnered is apparently irresistible. Most egregious is the recurring symbol of Pop-Tarts, Anna’s subsistence of choice. She eats them in the book’s first chapter, its final chapter, and on multiple occasions in between. They’re perhaps featured in the story for their empty nutrition, a fitting indicator of Anna’s borderline professional survival. Much like a child who never expands their taste palate beyond elementary-age chicken fingers, Anna refuses to strive beyond the pre-packaged advantages of her youth: financial privilege and talent. Neglecting to seize these gifts and move her life onward, Anna careens toward what can most certainly be defined as failure. While the Pop-Tarts may ultimately work as an effective symbol, they need not have been shoved into so many scenes—in all their distracting capitalization—for the sole purpose of creating a “thing” intended to stick out in reader’s minds. Appearing only at the beginning and end would have been fine; a little restraint would have worked wonders. An honest performance review must point out these shortcomings, but they’re easy enough to forgive so as to enjoy the great many things Talent does right. This novel is sure to be enjoyable for anyone who has ever had even a passing interest in authorial intent behind a text. Especially those readers who are not academic scholars; we, who have wisely preserved our ability to enjoy the experience of reading a book.